Until 1986 this species, along with the true A.flavipes (L.) and A.stierlini (Heyden) was recorded as A.flavipes (L.). The three species were recognised as such by Speight et al. (1986) in time for many of the verified existing records to be mapped separately in the carabid atlas (Luff) and so show that A.curtum is widely distributed in England and Wales, in the west many records are coastal and in the northeast, above York, there are no records. A. flavipes is represented by a few records centred around Humber and the Wash while A.stierlini is mostly southeastern north to south Yorkshire. The aggregate map includes some scattered Scottish records north to the Highlands suggesting that curtum has a very wide mainland UK distribution. The species is generally common on moist and heavy soils and occurs throughout our Watford area. Lindroth states open ground and usually near water, which does not altogether correspond with our own observations. We have recorded them from under logs and in pitfall traps heavily shaded by Crataegus (etc) by the pond below Cassiobury park, occasionally throughout Whippendell wood, adults running in bright sunshine on a garden path in Watford town centre and from pitfall traps along the banks of the river Gade at Cassio bridge. Adults occur from May to September and are probably spring breeders (luff, ibid). 3.8-4.5mm. Among the British fauna quite distinct, reminiscent of a small Elaphrus, entire upper surface shiny metallic bronze with violet or blue overtones. Head coarsely granulate and obscurely punctate from hind margin of eyes, very finely granulate behind this, longitudinally furrowed and with two setiferous punctures along inner margin of eyes. Eyes massive, width across eyes greater than width of pronotum (22:19). Palps testaceous, terminal segment of maxillary palps reduced. Antennae gradually darkened from fifth segment, sometimes only slightly so. Pronotum cordiform, strongly constricted before sharp, acute hind angles. Convex, impressed and with small oblique ridge inside hind angles, finely bordered laterally and with a long seta at widest point. Surface transversely rugose, densely punctured and with very short pale recumbent pubescence. Elytra broadly oval with strong lateral borders, without striae but with obscure longitudinal wrinkles. Each elytron with two fovea; one before middle and one behind, the posterior are sometimes obscure. Surface randomly and densely punctate, short pale pubescence present in patches. Legs testaceous or with femoral-tibial joints slightly darkened. Foretibiae strongly notched before apex. Basal segment of male protarsi dilated. Speight, M.C.D., Martinez, M and Luff, M.L. 1986. 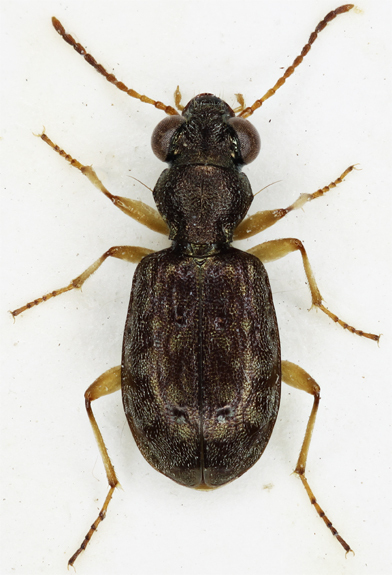 The Asaphidion species occurring in Great Britain and Ireland. Proceedings and Transactions of the British and Natural History Society 19:17-21.